Unusual rhythms and a myriad of genre influences make singer/songwriter Nadine Shah a difficult artist to pin down. There are obvious jazz elements, but they are underscored by exotic keyboards, funk guitars, pulsing electronics, gothic atmospheres, traditional rock and a pervasive sense of drama—a version of Bauhaus if they took their cues from David Bowie‘s Blackstar. It’s apocalyptic post-jazz doused in a psychedelic tonic. The chaotic nature of the influences could make for a rather disjointed experience, but Holiday Destination is held together by Shah’s distinctive voice and delivery. Her vocals have the sort of souring quality that could fill the Royal Albert Hall while still being well suited for a smoke-laden jazz club. It’s a fuller take on PJ Harvey with Siouxsie Sioux‘s theatricality. 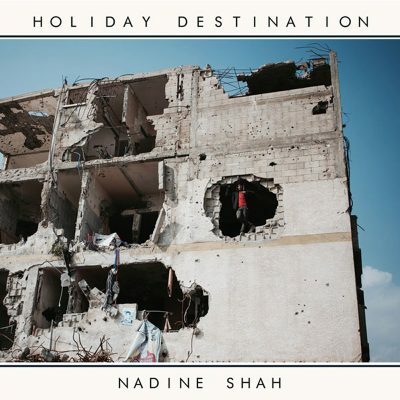 Lyrically, Holiday Destination is a vicious little protest album with a landscape decorated by refugees, heroines, dead musicians and a “fascist in the White House.” Shah is British, but her concerns are universal. The album begins with “Place Like This,” a funky groove with guitar that nods toward Bowie’s “Fashion” and The Cure‘s “Hot Hot Hot!! !” Shah’s vocals here feel a little disembodied, trance-like. The title track, “Holiday Destination,” feels like a visit to a B-movie horror excursion to the Twilight Zone, a parable of greed in a decimated city. With “2016,” Shah addresses the consequences of turning 30, the changing relationship she has with the world and its evolving political nightmare. The arrangement is fairly stark, underlined by a gurgling bit of electronics and punctuated by the sharp strum of guitars. “Out the Way” features military drums, the drone of horns and a punchy vocal that overemphasizes each word. It feels a bit too repetitive for its own good—a shame, because it ends rather well. If only the entire journey were as adventurous. The album takes a distinctive shift with “Yes Men,” which features a guitar riff that recalls early ’90s ethereal shoegaze, a nod to His Name is Alive, Faith and the Muse or The Moon Seven Times. It’s the most conventional song on the album, and while I can see it being the standout track for some, it feels too contained and restrained. “Evil” is another stark track where Shah addresses those who pass judgement. It has a wonderful experimental arrangement that utilizes aspects of Mogwai‘s soft-loud-soft formula. The only problem is that the song should have been stripped back to a three-minute blast, rather than a five-minute drone. The repetition of the chorus distracts from what could have been. “Ordinary” is a nice recovery, a straightforward dash with piano runs, buzzing electronics and backing vocals pushed through a vocoder. It’s a little too polished, not nearly as reckless as I would have liked, an instance when the musician’s precision is a little too exact. “Relief” is filled with sci-fi sounds, horns and a general vibe that David Lynch could dream up. “Mother Fighter” is a more traditional track with a great hook, but again, it feels a little too grounded. I’d be interested to hear what this particular track sounds like live. The album ends with “Jolly Sailor,” a somber electronic ballad that builds to the musical equivalent of a sunrise.